Afternoon of January 6th, Vice secretary of the Party Working Committee and assistant investigator of the Jining High-Tech Zone Administrative Committee Yin Feng, director of High-tech Zone Comprehensive Bonded Zone Wu Jingguo and other leaders visited Shandong China Transport Group for investigating in the developing condition of the enterprises e-commerce, cross-border e-commerce business, information industry construction and intelligent terminal manufacturing etc. Qu qing, chairman and managing director of China Transport Group, Han yong ,the vice managing director of China Transport Group, Li Zhenbo deputy general manager and Guan Chenghui enterprise office director and other Group leaders received visitors. Accompanied by General Qu and Han, the leaderships firstly visited Shandong China Transport Group e-commence company, cross-border e-commerce company, network information company, software technology company, Weixin agricultural technology company, Carter intelligent robot company etc. 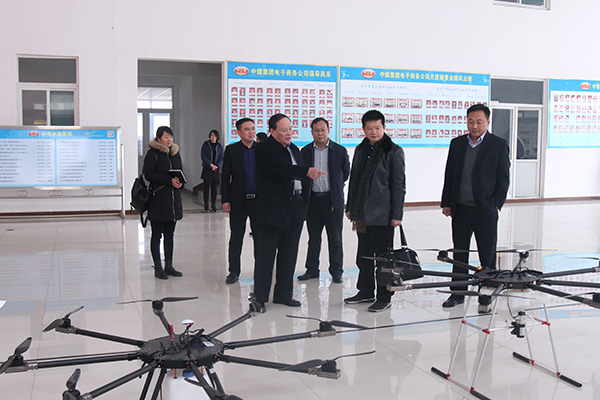 They watched the live demonstration of high-tech unmanned aerial vehicles and intelligent robots, which are independently developed by Shandong Carter intelligent robot Company of China Transport Group, gave a very high appraisal. Meantime, General Qu gave detailed reports to the visiting leaders on the development of China Transport Group in industrial transformation and industrial structure optimization and upgrading in those years. General Qu focused on our Group'' active exploration and efforts in the field of e-commerce, cross-border e-commerce, enterprise information construction, intelligent terminal manufacturing. Secretary Yin and other leaders highly praised and recognized the outstanding achievements of our Group from the traditional manufacturing enterprise successful transformation into a new type key enterprise and spoke highly of the omni-directional application in multi-industries and multi-fields that achieved by us based on Internet+,Big Data, Cloud Computing and other latest information technology. Secretary Yin pointed out that China Transport Group insist on the business model that transforming the traditional commercial by information technology represented by the internet technology, concentrate on upgrading the enterprise to a new industry development model combined informationization, intelligentization, ecologicalization and systematization, unceasingly exploit and innovate in the business, management and brand, walk in the forefront of the development of information industry, made a good example for the provincial industrial enterprises to develop e-commerce business, set a benchmark and led a way for the information technology development of the enterprises in Jining Hi-tech Zone. The main emphasis of our investigation is to completely learn the developing and business model of e-commerce enterprises through going right to their first line for field observation, investigation and study. The purpose of the all work is to lay the foundation for Hi-tech Zone government to make the next effective economic development plan. Meantime, we must popularized China Transport’s successful transformation experience and let more enterprises to observe and study for better driving the overall transformation of the industry and economy in high-tech zone. 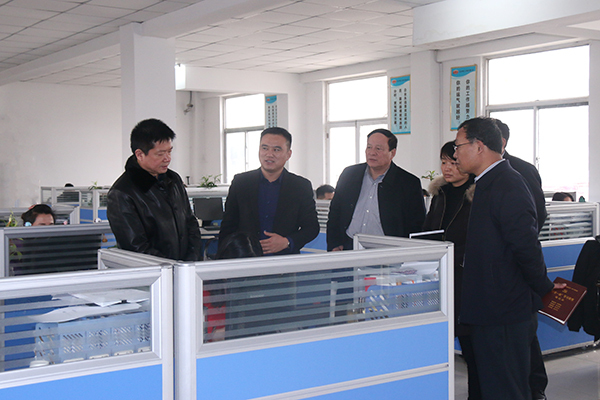 Secretary Yin inquired exactly about the construction of China Transport Group e-commerce industrial park and the elite training base. He said, China Transport Group e-commerce elite training base provide an excellent platform for the e-commerce developing in our city. Next, we should popularize China Transport advanced management concepts and e-commerce developing experience widely through Jining Industry and Information Commercial Vocational Training School, adopt the way of guiding by government and training by enterprises to together push the rapid development of the industrial e-commerce business in the whole zone and better guide more enterprises to embark on the road of e-commerce development. Finally, Secretary Yin defined the national and Hi-tech Zone policies of supporting the development of e-commerce business, and pointed out that the next step High-tech zone will make main policy support to China Transport Group e-commerce industrial park to build a first class e-commerce demonstration park in High-tech zone, Jining city, Shandong province and even the country. General Qu said, very grateful to the Hi-tech zone leaders care and support in the development of China Transport Group, China Transport Group will positively response to the national policies , make full use of the Group’s information industry in the city’s unique advantages, share our successful experiences in the informatization development with other enterprises, actively play the leading role to better explort the new path of developing e-commerce business for the industrial enterprises in Jining and make more positive contribution to the development of industrial economy and informatization in Jining, Shandong province and even the country.